Changing the CID on an SD card – Working! 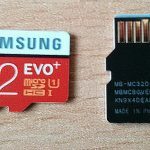 (tl;dr – skip to bottom for instructions, see also update post) The CID register on SD cards is supposed to be read-only, which means it can be used to lock devices to specific SD cards, preventing the user swapping them out, which is very annoying. This can result in you being stuck with a smaller card than you’d like in a device or not being able to use a backup in case of damage. 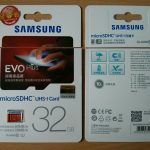 If you’ve found this page by looking for help on this topic you’ve probably already seen Bunnie Huang’s SD card hacking presentation, unfortunately I wasn’t able to track down any APPO AX211 based cards, which I thought would be my best bet. In that presentation was mention of vendor commands for a Samsung eMMC used as the built-in storage on an Android phone. 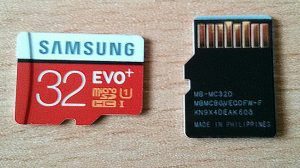 I’m not well enough versed on the technology to know quite what the difference between eMMC and SD cards are, aside from the way SD cards are packaged of course – although that might be all there is to it. Reading around they seem work in the same way and appear the same within Linux. Then I stumbled upon SamDunk, where Sean Beaupre had managed to unlock a Samsung phone (to developer mode) by reverse engineering some of the eMMC firmware on his device and finding commands that allowed the CID to be unlocked and rewritten. 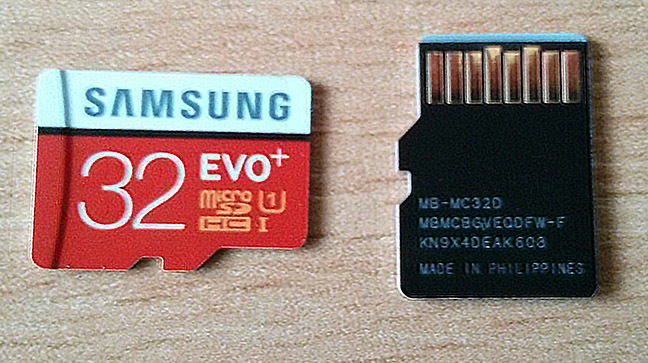 So I started buying Samsung SD cards, hoping for one with the same moviNAND core as the eMMC in their phones. I now also have a stack of Samsung SD cards on my desk, but with the last different one I found I struck gold! 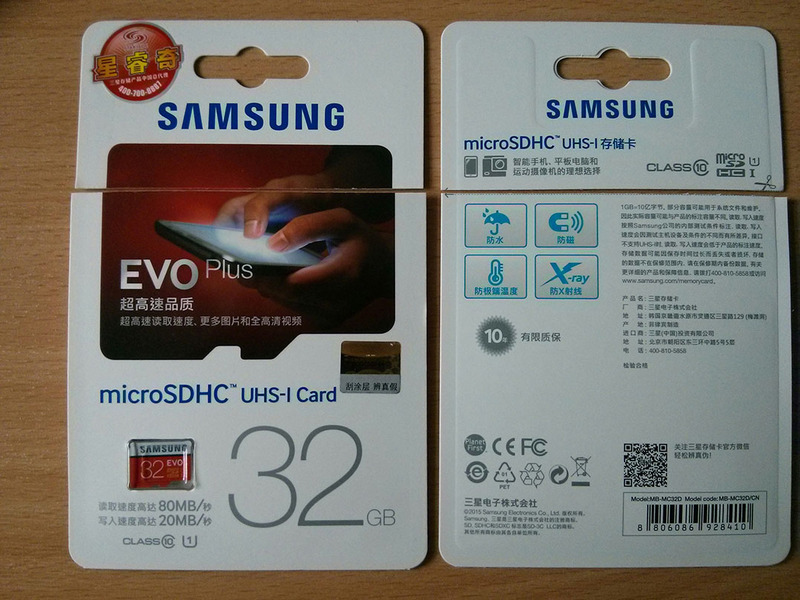 (Collecting Samsung cards is more expensive than cheap Chinese ones and it takes some effort to avoid getting fakes.) The Samsung EVO Plus 32GB MicroSDHC card took the commands from SamDunk and let me change the CID. I have taken the SamDunk code and reworked it a little to make it easier to use for SD cards, but all the credit really needs to go to the original author. To use you simply need a rooted Android device with an SD card slot. Copy the evoplus_cid binary to the device and put it somewhere with a proper Linux file system (not FAT), then apply execute permission to it. Run the tool and point it to the SD card device e.g. /dev/block/mmcblk1 (you almost certainly do not want to use mmcblk0, that is likely to be the built-in storage on your device). List the /dev/block folder and make sure the device you going to use appears and disappears as you insert and remove the SD card to be sure. Supply the new CID you want to set on the command line. If you only need to change the card serial number (part of the CID) you can supply the old CID and the new serial number and the new CID will be calculated for you. I suggest you make a note of the old CID first, in case you want to set it back later. This can be found in the file like /sys/class/mmc_host/mmc1/mmc1:0001/cid, but the path may vary, and again make sure you are looking at the right card by checking it disappears when you remove the card. You can find the code here: https://github.com/raburton/evoplus_cid (compiled binary is in the lib folder). Use entirely at your own risk. Use only against genuine Samsung Evo Plus cards, anything else is unlikely to work and could be damaged. Even the right card could potentially be damaged!